Dark mission: Escape from the city! Hero mission: Stop the alien's tank! 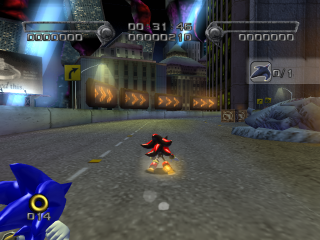 Lethal Highway one of three possible second levels of Shadow the Hedgehog; in the game's branching path structure, it follows from siding with Sonic during Westopolis. This stage is the route leading out of the city, with Shadow traversing the cumbling road as the Black Arms make a hasty retreat through the fortified positions of G.U.N. soldiers. Perhaps due to Shadow and Sonic performing total xenocide in downtown Westopolis, Black Doom decides to get out of town after acquiring a third Chaos Emerald, demanding that Shadow accompany him with the other two emeralds thus collected. Sonic, however, wants Shadow's help again, this time to destroy the Black Tank. Either way, at the end of the level Shadow demands that Doom surrender the yellow Emerald to him. Unimpressed, Doom summons Black Bull to charbroil Westopolis and Shadow. If you obediently followed Black Doom, after defeating the boss Shadow will warp to the next stop in his whirlwind adventure, Prison Island. If you destroyed Doom's precious Black Tank, however, Shadow will then wander about for that damn fourth Chaos Emerald before stumbling upon Circus Park. Yet another highway built precariously high in the sky, one of the biggest dangers of Lethal Highway is falling to your demise. The road itself is crawling with Black Warriors, Black Larve and Black Hawks, intermixed with an occasional outpost of G.U.N. troopers or robots. There are many scattered bombs that detonate and destroy sections of the road when approached, and Dark Spin Dash slime covering portions of the stage. Some of the broken debris and roadside fixtures can be utilized as melee weapons and some motorcycles, convertibles, and SUVs still remain operational, allowing Shadow to run over whoever happen to be his enemies at the moment. Jump off ramps on steep declines to possibly nab an item monitor. Rockets and grab bars serve as additional gimmicks. In the background are advertisements for diamond rings, a car called "Control Chaos" (Chaos Control backwards), and the NiGHTS into Dreams hotel (seen also in Sonic Adventure 2's Radical Highway). This page was last edited on 31 October 2017, at 18:16.